This tactic is the Watchfire For Freedom, set alight in an urn directly opposite the White House on January 6, 1919 and kept burning day and night by members of the National Women’s Party in support of the demand that women be granted the right to vote. Some background first: The Watchfire For Freedom came after the considerable momentum for women’s suffrage won in the first 15 years of the 20th century. At that point, the National Women’s Party, the militant wing of the suffrage movement, had decided to target President Woodrow Wilson, demanding that he actively support the passage of a national women’s suffrage amendment. Even the patriotic fervor surrounding the US entry into World War 1 didn’t stop their 24/7 pickets at the White House. Neither did the arrests, jailing and, when they began hunger strikes, brutal force-feeding of NWP leaders like Alice Paul. Broad popular anger at this mistreatment swelled and Wilson caved in. While the war was still raging in early 1918, he pledged to push through Congress the vote for women as soon as combat ended. Here’s where the Watchfire comes in. With the war over in November 1918, and the presidential promise of support in hand, how could the movement keep up the momentum? The Watchfire For Freedom urn was set alight, and kept alight, as the focal point for organizing and not merely as an abstract symbol. Wilson had led the US into the war in order, he claimed, to “make the world safe for democracy.” Every time he made a speech or issued a statement proclaiming or calling for democracy and freedom in war-torn Europe, Women’s Party leaders would take a copy of Wilson’s words and solemnly burn it in the urn, denouncing any talk of democracy when more than half the population was denied its most basic trapping in the US. 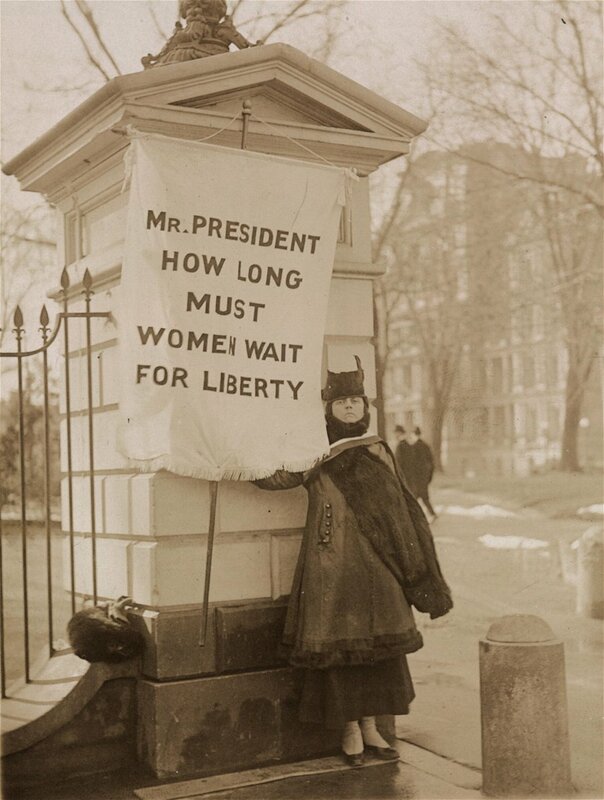 The Watchfire For Freedom stayed right in front of the White House until June 4, 1919, when the 19th Amendment passed the Senate. So what are the particular merits of this tactic? It provided a central focus for the suffrage movement when pressure needed to be increased to clear the final blockades of male supremacy in Congress and in state legislatures. It kept the focus concentrated on Wilson, the head of the Democratic Party, rather than dispersing it. It provided regular news to be reported when newspapers were the sole form of information (every big city boasted numerous papers and even small towns had one) and many of those papers were pro-suffrage. It used the enemy’s weaknesses against him--the hypocrisy of proclaiming a new and democratic Europe while denying democracy to women here was clear and easy to understand. It drew on the strength of the movement--the mainstream suffrage association had more than a million members and the National Women’s Party over 50.000. While maintaining a permanent vigil at the White House took resources, women were willing to travel from around the country and do their stints--like the Minnesota contingent headed by Berthe Moller, who brought pine boughs from their home state to burn in the urn, and who wound up in the hoosegow, evidently because they also added an effigy of Wilson to the flames! Might imitating this tactic work today? Probably not, but there are things to be learned from the reasons why it would likely fall short. First, most issues today are not as tightly focused as winning a single Constitutional Amendment, and few have a movement in the millions united around such a single political goal. Second, tactics pioneered by the National Women's Party have become ho-hum--their protests during the war were arguably the first mass civil disobedience protests at the White House. And speaking of ho-hum, what about calling an elected official a hypocrite? It's universally understood today that politicians are lying double-talkers who will say and promise anything to advance their own interests, and those of their backers. Publicly charging them with hypocrisy usually gets from their most ardent defenders, whether Republican or Democrat, not indignant denials but tortured explanations of why political realpolitik demands that they fudge things so much. And, of course, there's the problem that changes in military doctrine over the last hundred years mean the word, or even the concept, "watchfire" never crosses the average American's mind today, unless he or she is for some reason singing the second verse of "The Battle Hymn Of The Republic." Congrats and a felicitous "hey, hey! good going!" to Jimmy on this new series on tactics. It may be worthwhile to include a discussion on the difference between tactics and strategy as part of the discussion. I was struck by the tactical similarities of the "round-the-clock" protests at Wilson's White House and the People's Organization for Progress' daily demonstrations for jobs, healthcare, peace, justice at the Essex County Courthouse in Newark (reported on by Fire on the Mountain previously). The obvious difference is the single, focused demand for suffrage of the women's movement in the early 1900s. The more interesting difference is, as bro. Higgins notes, that even the President of the United States could once-upon-a-time be shamed by hypocrisy! The similar attempt to shame the Government during the Double-V campaign fell on less fertile soil. This is easily explained by white-supremacism, but it also reflects the trend to excuse lies and inconsistencies as reflections of "real politik", as Jimmy points out.